Usually when I'm ill, feeling very down, and just want to sleep all day I often want to have one of my favourite comfort food - lugaw. It's also called a number of different names like - pospas, porridge, congee, and arroz caldo. Nothing beats the smell and taste and satisfaction of eating it while your nose is drooling from a bad cold or flu. If it's for someone with a stomach upset you cook and serve it without oil or meat. Normally the meat that accompanies the Filipino version is goto (beef tripe) or chicken. Since I do not want to spend a lot of time cooking it I often do the chicken version. It takes time to tenderise the beef tripe, you know. The malagkit (glutinous rice) in the recipe is optional. It is added to make the soup a bit thicker. Another optional ingredient is the kasubha I think this is the Pinoy equivalent of saffron. It makes the lugaw a bit reddish/yellow which is not really essential and does not add much taste to it. And finally, the variation of adding vegetables came from my mother-in-law. It's not to everyone's liking although I love eating chunks of veggies in the lugaw. Slurp slurp ... aaahhhh! Heat oil in a big pot or saucepan. Saute garlic in low heat (so it will not burn) until brown. Fry onion in the same oil in medium heat until translucent. Add ginger and cook for another 3 minutes. Add chicken and patis, stir for a seconds then cover and simmer for about 5 minutes turning the chicken once in a while. Stir in all the rice and mix with the chicken and patis mixture. Let the rice absorb the patis for about 5 minutes while stirring occasionally. Add in the water and bring to boil. Turn down heat to low and simmer for about 30 minutes or until both chicken and rice are cooked. Stir occassionally making sure the rice does not stick at the bottom of the pot. [Optional] At this point you can add chopped vegetables of your choice to the pot and cook until they are done. Favourites are broccoli, carrots, peas, etc. Ladle into bowls; sprinkle chopped green onion, kasubha, and reserved garlic on top. Serve with lemon or calamansi juice and more patis. It's me again and just to add a little twist to this great Filipino recipe, I have a "technique" that was disclosed to me by Sam, a great chef from Hong Kong who now works in San Francisco. Mind you we had to ply him with 10 G & T's and a Johnny Red before he capitulated. Anyway, the chicken strips are marinated, Chinese style ( 1 tsp soy sauce, 1 tsp salt, 2 tsps corn oil, 1 tsp corn flour and 1 tsp sugar). Plain flour can be substituted for corn flour. Marinate for 3 hours and then add this as accdg to your recipe instructions. This actually makes it more palatable.I also cook the rice separately, parang Chinese style, and then add the sauteed ingredients to the pot of simmering rice. If I get even more matakaw, ehe, creative pala, I add cubed potatoes and boiled egg. Surprisingly, the tripe I buy from Booths and Tesco can be cooked in 10 minutes. I boil them first for 5 mins to "cleanse" dahil minsan it has a bit of a smell, then add the pieces to the pot. I normally am reticent to use tripe because of BSE (mad cow disease, not the Phil education degree) but sometimes, I honestly think I will definitely go mad if I don't eat tripe with lugaw? Cheers and bon appetit!!! P.S. I have a lot of kasubha in case you are interested. 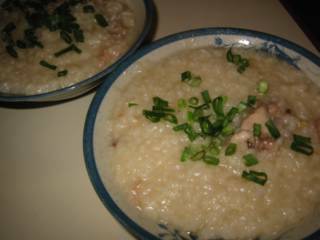 Celia, I was just thinking of making some lugaw since the weather is starting to cool off where I am. This looks wonderful. Made me want it for a midnight snack. Yummm! BTW, I linked you on my site, I hope you don't mind. Hi jmom: Link away! I will link yours as well I hope that's okay. Thanks for dropping by. Angie: I will definitely try that technique. Do you remember in HK they cook the rice/congee separately then just add meats, crispy something (ano ba yon? ), and sliced bicho-bicho (na hindi matamis) before serving. Yum! Celia and JMom, ako, rin! I was just thinking of having lugaw (while I was walking earlier in my gardens amidst the gentle rain) tonight. Angie, I copied that tip!